Astrobiology challenges us to ask – and attempt to answer – framing questions about life in the universe. How far does life extend in space and time? Is life integral to existence, or just an accident? Theodore Walker, Jr. and Chandra Wickramasinghe tackle a very narrow slice of this problem. Their focus and transparency are commendable, but by the end, they have only built a bridge from fringe science to contentious theology. From the outset, the authors are clear about their framework. For subject matter, they have chosen the convergence of panspermia, panpsychism, and panentheism. Panspermia is a scientific theory that life occurs throughout space and arrives on Earth by way of comet or free-floating cells and viruses. Panpsychism is a metaphysical theory that aspects of consciousness can be attributed to very small things (like atoms) and very large things (like the universe). Panentheism is a theological doctrine holding that all things are in God, though God is greater than the sum of all things. For methodology, they have chosen “constructive post-modern science,” which exemplifies suggestively, rather than demonstrating definitively. The first 83 pages form an essay, arguing that modern science – particularly astrobiology – exemplifies panspermia, while modern philosophy and theology exemplify panpsychism and panentheism. These fields converge as we begin to see life as a panoramic property, in and through all material things, and God as that force which makes this occur. There follow two appendices. Wickramasinghe devotes 18 pages to defending his position on panspermia. 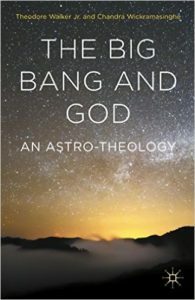 Walker provides five mini-essays reviewing other works of astrotheological significance. The work concludes with a staggering 80 pages of references, including no less than 100 by Wickramasinghe and 150 by his mentor, Fred Hoyle. The authors are firmly committed to a narrow interpretation of Charles Hartshorne’s neoclassical approach, related to the process theology of Alfred North Whitehead. This includes panpsychism and panentheism, both of which have highly contentious interpretations. The book provides a survey of this deep literature, but is not long enough to present systematic argument for either position. Rather it simply claims one interpretation of each to be correct and gaining in popularity. The book provoked me to think more critically about how doctrines of God vis-à-vis reality shape theories of life vis-à-vis reality. If you come to the book accepting panspermia, panpsychism, and panentheism, it highlights several provocative, if weak, correspondences between them. If not, I cannot recommend the $100 price tag.